the launch of the Transit Layer, a feature that makes it easier for citizens and tourists around the globe to access public transportation line information in their cities. We’re continuously expanding the coverage of Transit Layer, and have added support for transit systems in China, Japan and Russia, which are some of the most complex and remarkable metro lines in the world. The Transit Layer is not only useful to plan a visit, but also to see a city's history, structure of transportation systems, and daily life. Let’s take a look at the Transit Layers for Shanghai, Tokyo and Moscow. China has launched subway layers for 10 cities, including Beijing, Shanghai and Guangzhou. Beijing's first subway line has been in operation since 1969 and Shanghai's subway system opened in 1995. Now, Shanghai has 8 metro lines, 162 stations and 225 km of tracks, making it the longest network in China, exceeding even the Hong Kong MTR. To get a sense of how widely used the subway system is, take a look at this image of the queues that can form during rush hour. Subways are the most popular and convenient transportation method in Tokyo; most of downtown Tokyo is easily accessible via subways. 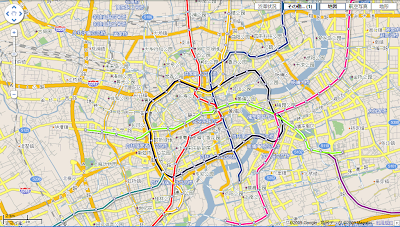 The Tokyo Metro Ginza line (drawn in orange) was first opened in 1927. There were many trams at that time, but they have since been replaced by subways because of the increase in automobile usage and lack of capacity and speed. Thirteen lines are in operation today and they carry more than 2.9 billion passengers per year, making this the world's largest subway system. One of the interesting things about the Transit Layer is that you can see the layout of the transit system. In Tokyo, for instance, you might wonder why the subways take a circuitous path around the central area and avoid it. This is because the area contains the Imperial Palace, which used to be the Edo Castle where the Shogun lived during the pre-modern era. Also, many of the subways are located under historically significant roads. Though Tokyo is filled with modern architecture, it has not been built from scratch, but rather it has been built on top of the old city. The Moscow Metro is the world's second largest metro system (in terms of passenger rides) and quite possibly the most beautiful. If you ever come to Moscow, you should definitely visit the Metro (but it's best to avoid it during the rush hour if you have the choice!). Meanwhile, you can check out the Metro on the transit layer for Moscow, together with the bus, tram, trolleybus and monorail lines. We have also launched the detailed transit layer for St. Petersburg recently. All in all, we now provide Transit Layer coverage for 90 cities in 26 countries, including many of the worlds largest transit networks. Earlier this year, we announced the launch of the Transit Layer, a feature that makes it easier for citizens and tourists around the globe to access public transportation line information in their cities. We’re continuously expanding the coverage of Transit Layer, and have added support for transit systems in China, Japan and Russia, which are some of the most complex and remarkable metro lines in the world. The Transit Layer is not only useful to plan a visit, but also to see a city's history, structure of transportation systems, and daily life. 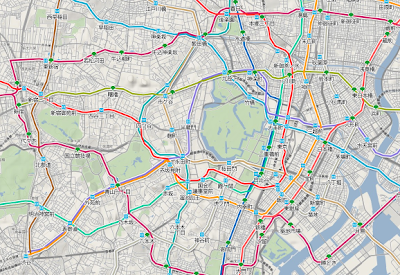 Let’s take a look at the Transit Layers for Shanghai, Tokyo and Moscow.